NASA Curiosity rover on the Red Planet since August 2012 and assessing the habitability of Mars. No doubt, Mars is holding its secrets tight — but if the ongoing work of detecting life proves positive, what protocols are in place to confirm such a verdict? Curiosity Chemistry and Camera Remote Micro-Imager photo of novel features, taken on Sol 1921, Dec. 31, 2017. Curiosity Mars Hand Lens Imager (MAHLI) photo acquired on Sol 1923, Jan. 2, 2018. Using an onboard focusing process, the robot created this composite by merging two to eight images previously taken by the MAHLI, located on the turret at the end of the rover's robotic arm. "Clearly early on Mars — in its first billion years — conditions were suitable for biogeochemical processes related to living systems to have operated. 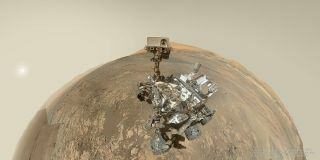 Now we await further data from Curiosity and the team," Gibson said. If one sees morphological evidence — evidence based on structures found on Mars — Rummel said that chemical analyses should then be performed to see if the results are consistent with the interpretation of the morphology. "Verification of the data in as many different ways as possible is good," he said. Rope-like and tubular structures within ALH84001 meteorite that were interpreted in 1996 as possibly being fossil bacteria. Twenty years later, that assessment still remains controversial. Leonard David is author of "Mars: Our Future on the Red Planet," published by National Geographic. The book is a companion to the National Geographic Channel series "Mars." A longtime writer for Space.com, David has been reporting on the space industry for more than five decades. Follow us @Spacedotcom, Facebook and Google+. This version of this story was posted on Space.com.